The Gerry Harvey-bred gelding Athletica franked the improved form and mannerisms displayed over a trip at his last start to come away with a rousing win in the $50,000 Class 4 race over 1600m on Friday night. Athletica (John Powell) races past Storm Ryker (Shafrizal Saleh) to take out Race 3. Storm Ryker (Shafrizal Saleh) did seem to have the race all stitched up when he charged to the front at the top of the straight, but the move proved to be a fraction too soon. Street Party (Juan Paul van der Merwe) had every chance but he lacked the dash to match the first two, finishing third another two lengths away. The winning time was 1min 39.13secs for the Polytrack mile. A one-time winner over 1200m in New Zealand, Athletica now boasts a local record of one win and two seconds from five starts for stakes earnings closing in on the $50,000 mark for Heptinstall. 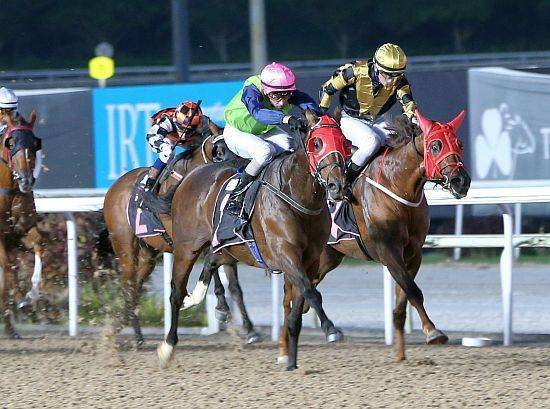 In a rare combination with trainer Saimee Jumaat, Powell went on to ring up a riding double aboard $130 longshot Red Riding Wood two races later in the $38,000 Kranji Stakes D race over 1600m.